During our facebook live, this card popped up all the time! We discussed Guidance and how you can know the difference between Divine Guidance and your own thoughts…trust your intuition today. If you feel doubtful, stay with it a little while and ask Archangel Haniel to deepen your intuition. Sleep on it a day or two, and if the guidance remains the same, then trust yourself. You are guided to trust your Inner Guidance now. Divine Wisdom, answers and clarity all lie deep within your own heart. You have always known the truth, the path to take – it is just clouded on this earthly journey by judgement, doubt and fear. 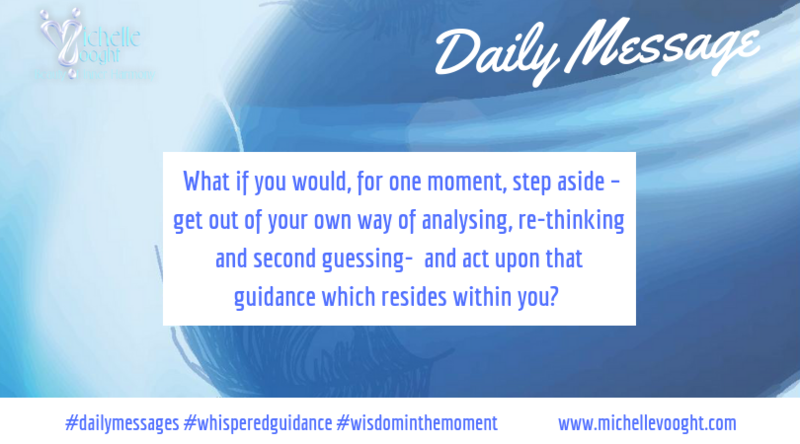 What if you would, for one moment, step aside – get out of your own way of analysing, re-thinking and second guessing- and act upon that guidance which resides within you? God and His Angels, Spirit Guides are always on hand to help us unlock our ability to act from Source. It is there, it was there from the beginning when you chose your earthly journey. Divine Wisdom and Guidance help us to make our daily life easier so we can grow spiritually. What is the tone and vibration of your Guidance? You will feel it resonating loud, clear, confident – perhaps a resounding YES. Or at first, it may be a whisper, soft and gentle – yet, the more you listen, the more you fine-tune it, it becomes stable until all doubt fades away. Be aware in every moment and don’t disregard any experience, thought or emotion as being wrong. Only allow yourself to filter it all so that you can get to the point where emotion fades away and what remains is Guidance. Receive the teaching loud and clear, so you can follow the guidance without doubt and fear. Wishing you a love filled, guided weekend – you will be OK, always.